All venues are handicapped accessible. A circulating shuttle, which runs daily from 3-11PM in a route throughout the festival footprint, is wheelchair accessible. Outside the Rochester Regional Health Club Pass Big Tent on East Main for people attending shows in the tent. Individuals needing assistance may call the Festival office in advance at (585) 454-2060 or see a volunteer at venue entrances. Individuals being dropped off may pull up at the corner of Main St. and Gibbs. Please be advised that no photography or video/audio recording is allowed inside any venue except by credentialed media photographers and official festival photographers. Anyone taking pictures will be asked to leave the venue. When you purchase tickets via the rochesterjazz.com secure ordering system you will receive a unique patron ID and E-ticket with a barcode. All online sales final. No exchanges, no refunds. For those who prefer a ticket be mailed, tickets will be mailed for a fee of $2 per order. For those without online access, call the office at 585-454-2060, to order a Club Pass or headliner ticket. Redeeming Headliner E-tickets (for shows at Kodak Hall at Eastman Theatre) - All headliner tickets will be scanned at the point of entry to Kodak Hall at Eastman Theatre. Print your E-ticket receipt at home and bring it to Kodak Hall to be scanned. Only one scan per bar code is possible. Bring your E-ticket receipt on your smartphone, and bring it to Kodak Hall to be scanned. No paper needed! Club Passes will now be personalized with your name and photo. You will receive an email on how to personalize your pass. It's easy and fast. Print your E-ticket receipt at home and bring it to the Festival Ticket Office at 100 East Ave from June 5-22 (10AM - 5PM, Mon-Fri) or June 23-July 1 (10AM - 11PM) to exchange for your Club Pass. Bring your E-ticket receipt on your smartphone, and bring it to the Festival Ticket Office at 100 East Ave (DATES TO BE ANNOUNCED) (10AM - 5PM, Mon-Fri) or June 22-June 30 (10AM - 11PM) to exchange for your Club Pass. No paper needed! Write down the order number and bring it to the Festival Ticket Office at 100 East Ave (DATES TO BE ANNOUNCEVED )(10AM - 5PM, Mon-Fri) or June 22-June 30 (10AM - 11PM) to exchange for your Club Pass. No refunds or exchanges. Once redeemed for an official pass, the pass is not transferable. 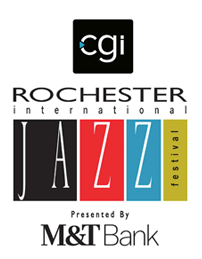 The resale of tickets for more than its face value without the written consent of the Xerox Rochester International Jazz Festival (XRIJF, d/b/a RIJF, LLC) is prohibited by law. As a festival patron, you assume all risk and danger incidental to attending festival performances, inside and outside any and all venues whether occurring prior to, during, or after said show(s). No alcohol, drugs or weapons are allowed in any XRIJF venues. Food or glass containers may be allowed in some XRIJF venues, solely at the discretion of venue management. No recording devices, still or video cameras permitted in any festival venues. No transmission or aiding in transmitting any description, account, picture, or reproduction of any festival performance. You hereby consent to the reasonable search for alcoholic beverages, drugs, or weapons. You hereby consent to the use of your image or likeness incidental to any display, transmission, or reproduction of the event. Festival staff reserve the right to refuse admission or eject any person whose conduct is deemed by the festival to be disorderly or who fails to comply with the terms and conditions herein. In the event of a cancellation for which there is no rescheduled date, a refund for this ticket may be issued at the option of the festival and may not include additional ticketing fees (i.e., ticketing operations fee, shipping fees, etc. ).